Last Sunday Michael and I went out to dinner at Apizza Scholl’s. It was going to be our “yay the February challenge is over” meal but I’d ended the challenge about three days short of the full month. Even though I was back to eating dairy and gluten, I still didn’t eat very much of it. Naturally I just kept eating the way I’d been eating for the February challenge, just with some real chocolate for dessert. 🙂 I think knowing that I COULD eat dairy and gluten again, made it easier NOT to. Michael felt a very real difference when he cut out gluten from his diet. Like I said in previous posts, he wasn’t snoring as much, his throat didn’t feel swollen and he generally just felt better not eating gluten. It was something he was considering cutting out of his diet long term. Even though I didn’t feel any different cutting out gluten and dairy, I don’t have a problem supporting him by reducing and/or eliminating gluten. I didn’t miss bread or pasta, really, so I don’t mind not eating it long term. Michael wanted to go to Apizza Scholl’s to test out eating gluten after a month of abstaining. Their pizza is our favorite in Portland and the crust is definitely not GF. We went there for dinner to test out how he’d feel after eating a bunch of gluten. I have to admit, I kinda missed pizza after refraining from bread products for a month! We got half Margarita with spicy pepperoni on it and half truffle oil cheese pizza (my favorite–which is weird because I hate mushrooms). It was fantastic. On a more positive note, earlier in the day, I did some baking! Michael had been asking me for days to make gluten-free brownies for him. I looked around for a recipe that had ingredients I recognized (and not a bunch of weird stuff I couldn’t pronounce, let alone FIND in a grocery store) and found this recipe. It seemed simple enough. In a saucepan over low heat, blend together butter and cocoa powder. Remove cocoa butter mixture from heat and let cool. In a bowl, mix together eggs, sugar, salt and vanilla. Whisk coconut flour into batter until smooth. Pour batter into a greased 11x7x2 or 8x8x2 inch pan. Bake at 350 degrees for 30-35 minutes or until a toothpick inserted in the center comes out clean. I turned on my Lisa Loeb Pandora station (no shame here!) and got to bakin’! I made the substitute of using the Splenda blend of sugar that I usually use when baking anything. 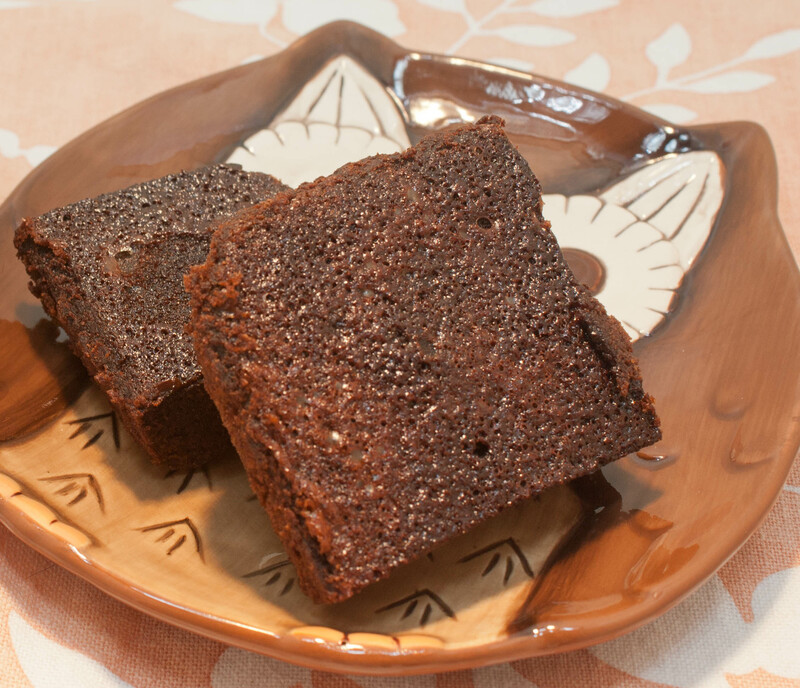 Using the Splenda blend saved me between 25-50 calories each brownie. I also used Brown Rice Flour because that’s all I could find at my grocery store. I was surprised at how many eggs were required for this recipe. Other than that, I liked the recipe because it was simple and didn’t have odd ingredients in it. I’m new to all this gluten free cooking/baking. I found a really helpful blog that explains all the differences between the gluten free options. Definitely check it out if you want to learn more about it. In her “Guide to Working with Gluten Free Flours” she explained that gluten free bread is never going to be light and airy like regular bread is and you just have to get over that. I think that might have been my issue with the gluten free thing–I kept EXPECTING it to be the same flavors and textures and it just wasn’t. So how did they taste? They tasted pretty good. The texture was definitely different than what you are expecting. It’s not the same as a fluffy, moist, thick brownie that you’d make with flour. It was dense, almost cake-like, and reminded me of like sponge cake or maybe coffee cake? It wasn’t bad, just different. I’d also added a handful of chocolate chips to the batter and that definitely made a difference! There were bites of the brownie that had oozing chocolate from the melted chips. I’d make this recipe again and I would add more chocolate chips, or maybe even butterscotch chips to it. Depending on how big you cut the pieces and if you use real sugar instead of the Splenda blend, the calories can range between 150-200. I cut 12 pieces out of the brownie pan, some slightly smaller than others, so if you make this and cut them all the same size you’d get about 10 pieces. Michael and I ate our brownies with a glass of chocolate almond milk. It was a nice treat while we snuggled on the couch with Fat Kitty and a movie. Look at him! 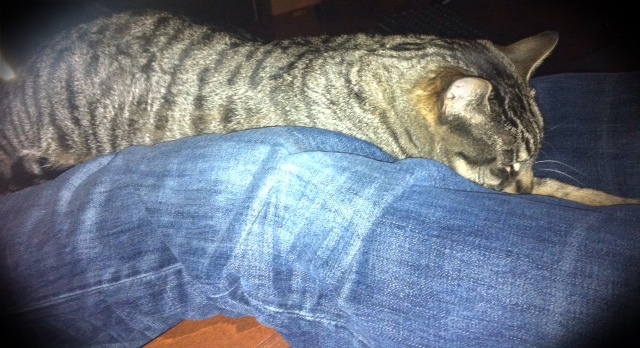 He stretched out on Michael and pretty much stretched the length of his legs. We ended up watching “Good Will Hunting” because I found out Michael had never seen it! When we were watching The Oscars and Ben Affleck gave his acceptance speech I mentioned how much I loved Good Will Hunting. When I found out Michael didn’t even know what it was I made him watch it. And he liked it. How could he not?!? I still feel absolutely no difference eating bread again. The pizza from Apizza Scholls didn’t make me feel bad, the next day I still felt ok. I even had a bagel thin for breakfast and still didn’t feel any difference. My official conclusion: no food sensitivities! Time will tell what exactly Michael is sensitive to. Sounds like maybe Michael should get tested to see if he does have a gluten allergy or celiac disease? That’s usually more reliable than experimenting at home. Could be something totally unrelated. Could be. I think it would be worthwhile for him. But he’s a man and refuses to go to the doctor for anything, despite how much I beg him to. But I’ll mention it. ahhhh. I have a man like that too. Hasn’t had a physical since he went to college. Good luck! Maybe now that he has more symptoms he’ll be open to it? I’ll talk to him about it. I don’t know much about celiac but if a test could tell him definitively what’s going on, I think he’ll be on board. This is not true in the least. I’ve looked into the costs of allergy testing before and was told it would cost $2000 and insurance won’t cover it. I’m not about to pay $2000 to be told that I can’t eat something I already know that I can’t eat. But is testing for Celiac the same as allergy testing? That might be covered by insurance. Explain what the value is in the testing at this point? I already know that I don’t like how eating flour makes me feel afterward and will avoid eating it 99% of the time. Why spend the time and money to get tested when I’ve already decided to just not eat the stuff anymore? Hopefully Michael is able to find some gluten free pizza crust and can enjoy pizza again soon! Your kitty is sooooo cute. Have a great Thursday Lisa. Roz@weightingfor50 recently posted..Dragging my a#@! I’m going to look for a gluten free recipe for pizza so we can try it at home. I have the brown rice flour so maybe that will work. It can take up to a week to 2 weeks for your gut to heal after a gluten exposure. For me 1 week. I know I can tell immediately if the food is inflammatory and I’ve had a gluten exposure. No blood work needed. Glad you’ll be supprting Michael. 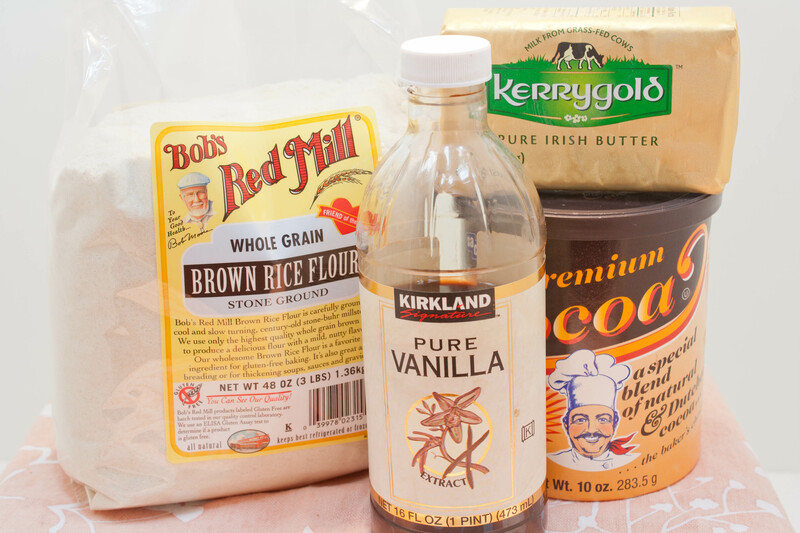 If you steer clear of junky gluten substitutes, better health and feeling good will be the outcome. My blood pressure is much lower not eating gluten. I have no problem limiting gluten in support of Michael. For example, we had burgers last night and he had a gluten free bun and I used a lettuce wrap. Didn’t miss a bun at all. Biz recently posted..Happy 21st Birthday Hannah! It’s been YEARS since I made brownies from scratch. It was super easy, though. I need to do more things from scratch. I haven’t but I want to! It sounds amazing. Coconut flour requires a lot of eggs. It is a very absorbent flour, which is why that recipe called for 6 eggs. That’s the norm. I wouldn’t use that many if you use another flour, just an FYI. Might be a little on the eggy side. I loves the coconut flour! I have had some decent luck with using Bob’s Red Mill GF flour blend for quick breads and such. A little more dense, but pretty tasty. Thanks for clearing that up! We live near Bob’s so I can easily go there and get GF stuff. I just haven’t yet! I need to. Thanks for checking out my blog Robyn! That’s too bad that the favorite pizza place makes Michael sick!! 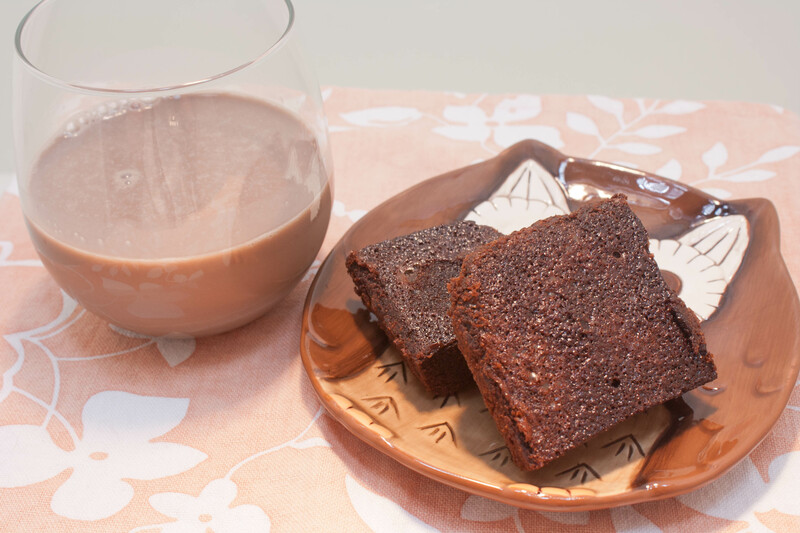 This brownie recipe is very versatile and is one you can mix the dry ingredients in advance, store the mixture and then add the wet ingredients when you are ready to make them. It’s from Pinterest. Add: 2 eggs, 1/2c vegetable oil, 1 tsp vanilla. Bake at 350 degrees for 20 – 25 minutes in an 8X8 pan. Substitute an entire can of black beans pureed for the oils and eggs. Add chocolate chips or whatever flavor chips you like. I’ve heard about using applesauce as a substitute but never tried it. Thanks for the reminder! I tried the can of black beans and it makes a very fudgy brownie. My husband and kids didn’t know that there were black beans in them either. Ok that settles it. I’m totally trying black bean brownies. I think gluten bothers me a little bit but I still eat it. LOL. 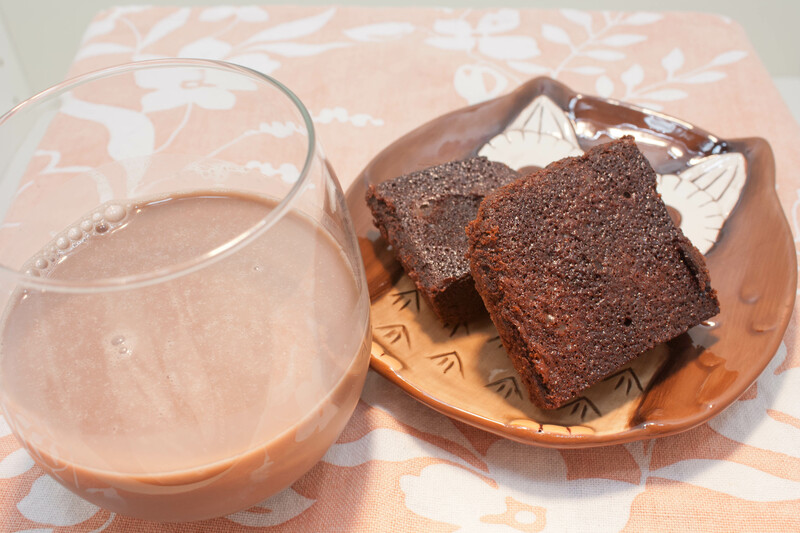 This isn’t a brownie recipe but it looks pretty yummy: http://www.coconutandquinoa.com/2012/12/21/gluten-free-chocolate-haezlenut-buckwheat-cake/ It’s from a cookbook called Small Plates and Sweet Treats which I think is gluten-free cooking. I’ve got it on hold at the library so I can check it out. It’s a bummer for Michael that gluten affects him, but I imagine not living in discomfort will help motivate him to stay off gluten. You (he) can still make all sorts of fruit crisps with oat topping! Oooh that recipe looks good! Thanks for sharing it. I once saw a recipe for a crustless pizza I’ve always wanted to try. I don’t remember where, or what it called for exactly, but I remember the technique. The idea was to replace the bread crust with a meat crust. You mix up seasoned ground beef, eggs, and rice (kind of like a meatloaf or meatballs, without the breadcrumbs), flatten it out into a crust shape, and bake it on a sheet pan until it sets. Then just cover it with your regular pizza toppings and toss it back in the oven until the pizza is done. I always thought that sounded amazing. One of these days I’ll actually get around to making it. Might be something worth considering if you two want some gluten free pizza. That sounds interesting. I haven’t heard of that one. I have heard of cauliflower crust. I’d like to try that! Thanks for the recipe! My Mom is trying to go gluten free and missing baked goods like crazy! I’ll have to make these for her this weekend. Oh good! I hope your mom likes it. Definitely add some chocolate chips to the batter. It made it so much better. 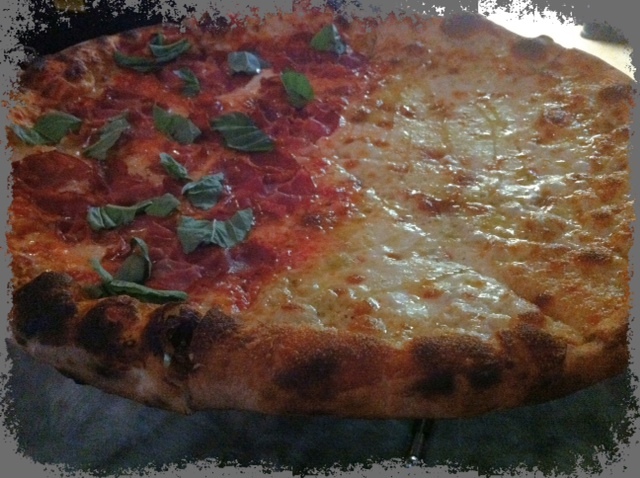 Just catching up – have you tried the gluten free pizza at Mississippi Pizza? I highly recommend it – it’s delicious!!! I didn’t now that Mississippi pizza had GF! They are one my favorite pizza places in Portland. I will definitely check it out. Thanks for the tip.